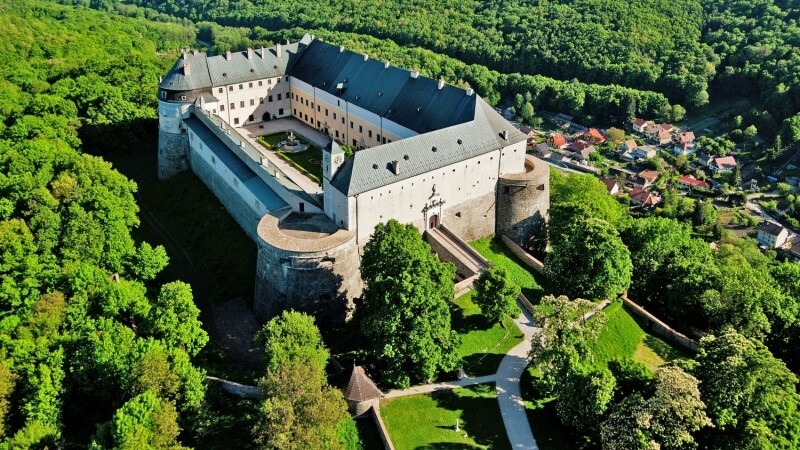 Nestled into the beautiful nature of the Little Carpathians, the renaissance castle Cerveny Kamen is one of the most beautiful and most preserved castles in Slovakia. 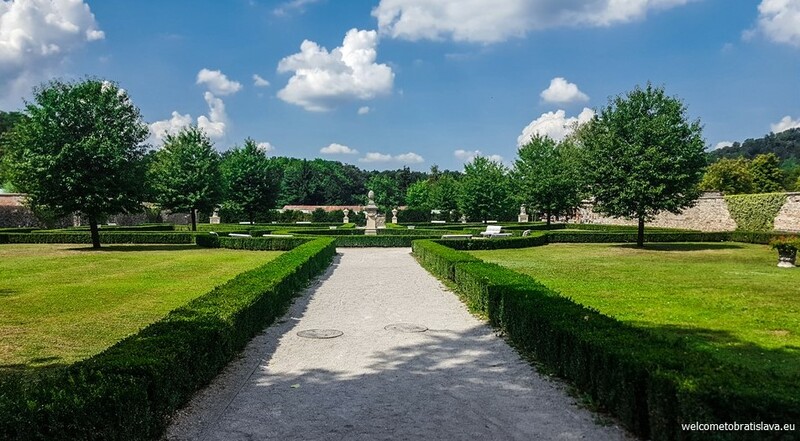 Take a walk in its enclosing romantic garden, learn about its spooky legend or admire numerous historical paintings and the exhibited furniture used by the aristocracy. Cerveny Kamen (translated as Red Stone) castle stands on the south-eastern side of the Little Carpathians, over the village Častá in the Pezinok district, near the town of Modra. A car drive from Bratislava city center would take you around 1 hour. It is definitely the most convenient way of getting there. 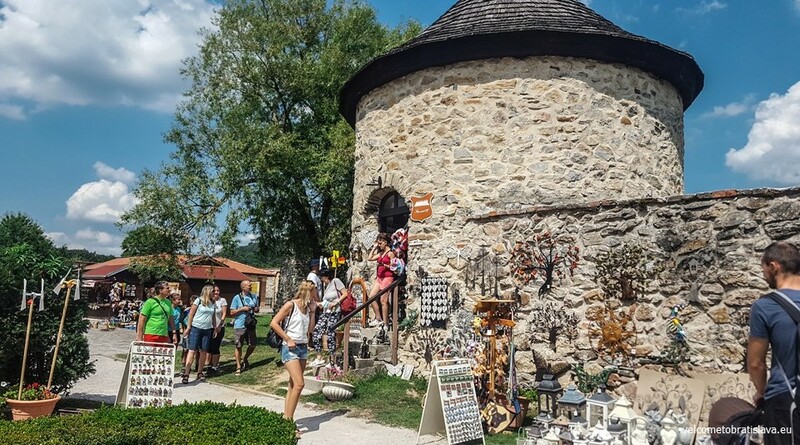 Take an asphalt road from the village of Častá and Píla and follow the traffic signs to get to the castle. An unguarded parking area lies next to the castle and is free of charge. There are many car rental services to choose from or you can use a mobile app to get a taxi in case you do not have your own car. There are also fine direct bus connections going approximately every two hours from Bratislava main bus station. The ride takes up to 1.5 hours. Get off at the stop “Častá, Základina.” You need to walk approximately 2 km through the village and a forest to reach the castle. We do not recommend taking the train as the closest train station is located 15 km away (in Pezinok) and you would need to take a bus afterwards anyway. The first mention of the Red Stone Castle tracks back to the first half of the 13th century. Throughout history, the castle has been owned by many famous names including Matúš Čák Trenčiansky, the Zápoľský family or the Turzo family. 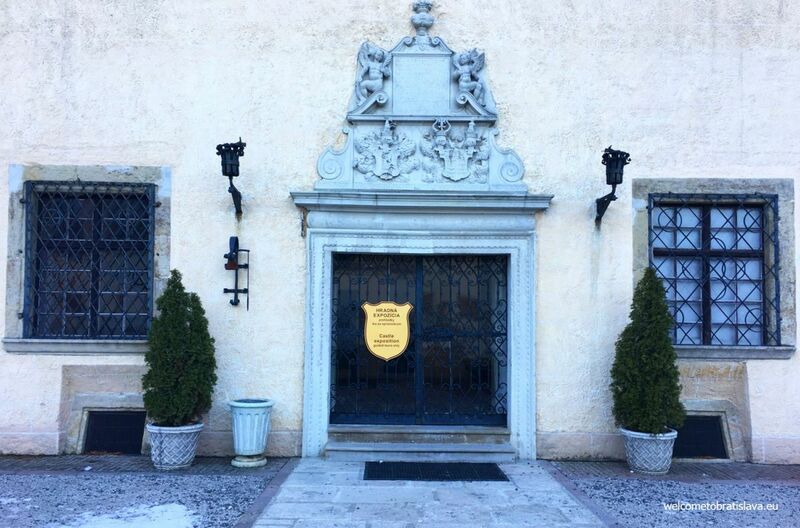 However, there were two families that had the most impact on the castle history and these were the famous Austrian-Hungarian nobility Palffy and the German business family Fugger who used to be one of the richest families of that time. Because of the strategic position, Fuggers rebuilt the medieval gothic castle with its estate into a renaissance fortress serving as a storehouse for goods traded across Europe. As the Turkish attacks were becoming ominous, Fuggers decided to sell the property. 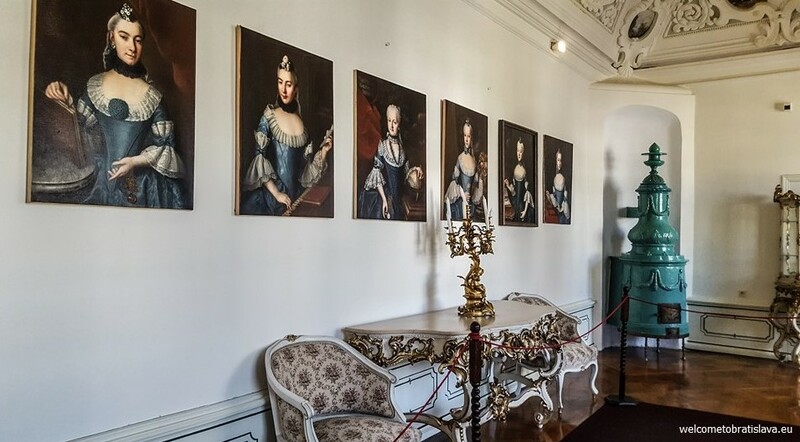 The new owner became young Baron Mikuláš II Pallfy who conducted many reconstructions of the estate and the castle and turned the fortress into habitable dwelling in an early baroque style. The last owner from the Palffy family left in 1945. Thereafter, the castle was proclaimed a national cultural property. The castle hosts one of the branches of the Slovak National Museum. 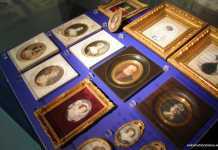 Its permanent exhibition focuses on the historical furniture of the nobility from the period of renaissance to the Art Nouveau style. The castle is open all year round but holds guided tours on everyday basis and more frequently during the main season (May – September). 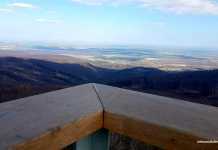 During the colder months (October-April) it is closed on Mondays and the tours are held less often. Therefore we recommend you to check their website for detailed information in advance to make sure there is a guided tour (and specifically in a foreign language) planned for time of your arrival as you don’t get to see the castle interiors on your own. 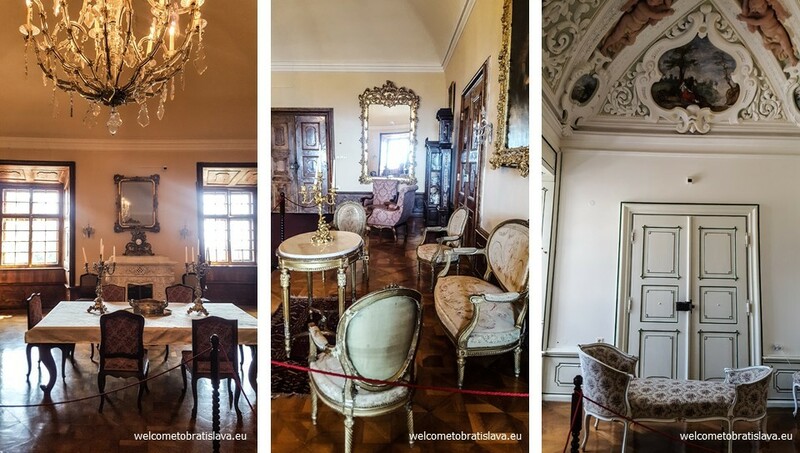 A Short-Guided Tour: 24 rooms of the castle display interiors of the noble residences from the end of the 15th until the beginning of the 20th century. You will be amazed by the beautiful halls, expensive looking parlours, authentic dining rooms or the biggest room of all – the knights hall. 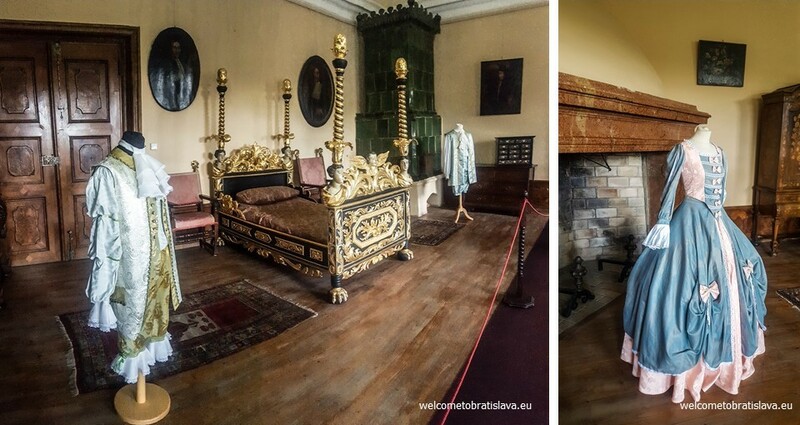 At the same time, some of the original interiors of the castle palace were preserved and can be seen during the tour. This includes a pharmacy, a unique room sala terrena, the chapel dedicated to the Assumption of Virgin Mary and the cabinet of weapons. The tour takes approximately 60 minutes. 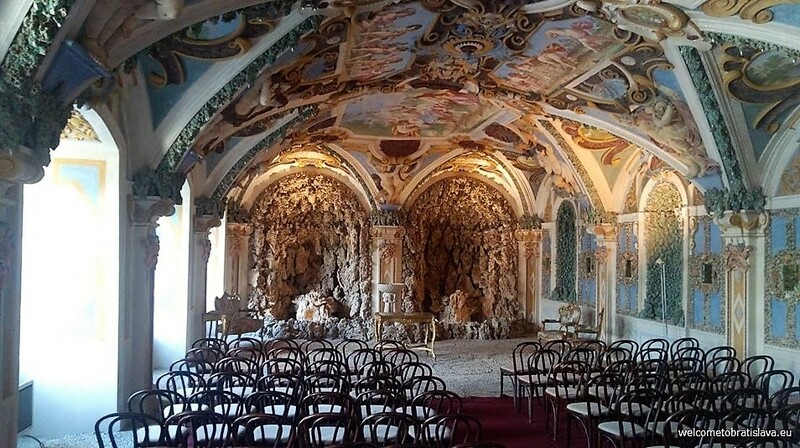 A highlight of our visit was the breath-taking sala terrena that was built in an early baroque style with rich naturalist stucco walls and an artificial cave with Italian fresco paintings. It used to host theater performances and nobility events and is now used for wedding ceremonies. Could you imagine a better setting than this? The authentic pharmacy preserved in the castle interior was used for producing medicine, but also cosmetics and sweets. It hosts a unique book of recipes from 1727 that contains 824 instructions! 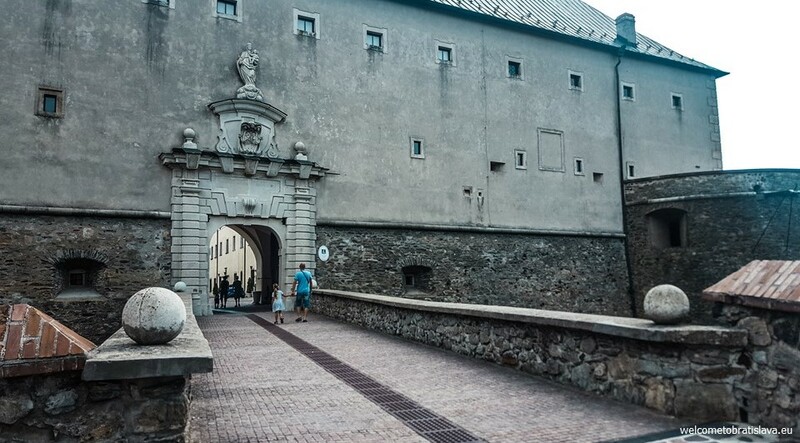 A Long-guided Tour: In addition to the exhibition of the short tour, you will examine the castle as a renaissance fortress. The tour exhibits a fortification system of two bastions and impressive cellars. The tour takes around 75 minutes. 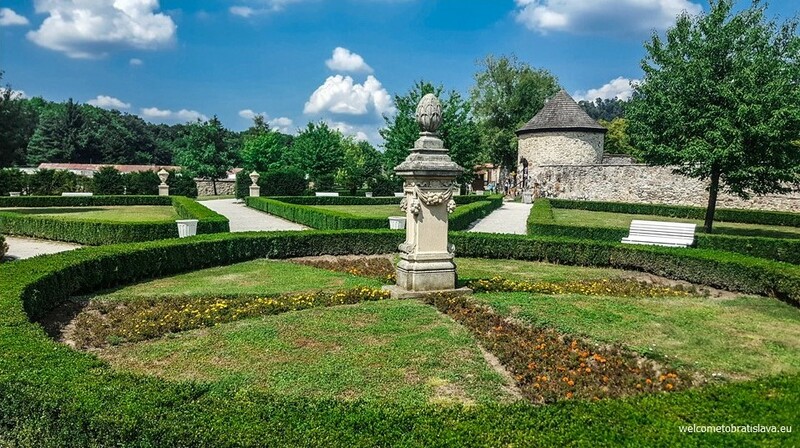 If you do not like guided tours with historical commentary, you will for sure enjoy the beautiful castle front yards and the castle surroundings with the French park. If the weather is nice, enjoy a cup of coffee from a coffee stand or at the cafe on the main court, walk around the park on your own, have a look at colorful souvenirs or just sit on a bench and catch the sun rays. There are many cultural events, historical festivals, weddings or special tours held at the castle. 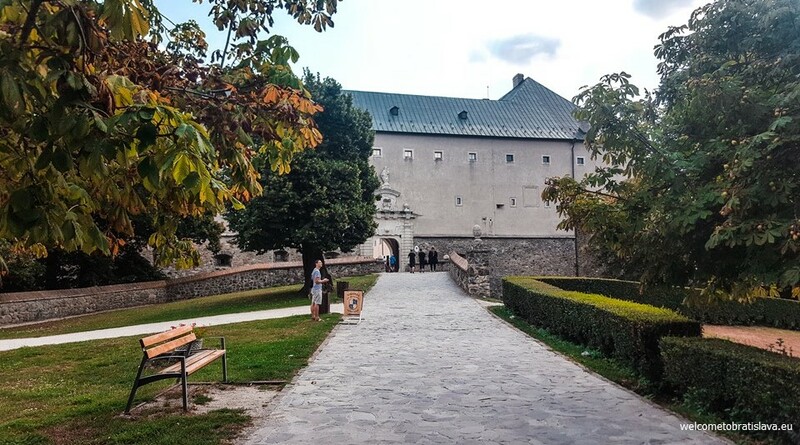 The castle estate hosts a falconry Astur with regular falconry demonstrations and is the largest collection of birds of prey in the Slovak Republic.